On September 13, 2006, more than five years ago, I appeared on Fox News Channel as a guest to discuss 9/11. I didn’t know in advance what the anchor would ask but it turned out he wanted to talk about planes on 9/11 in an interview lasting under 3 and 1/2 minutes. I answered as best I could, not a great, polished performance but OK enough. I squeezed in a handful of facts that raised serious questions about the airliner fiction. Fox probably believed, as 911 “truthers” did and still do today, that putting the no plane finding in front of the public would hold the movement up to public ridicule and discredit it. Ah yes, the insane no planers. Despite the fact that no plane crashes on 9/11 is one of the best established results of 9/11 research, subsequent fallout included Professor Kee Dewdney booting me out of his “scientific panel investigating nine eleven” (SPINE) on the grounds that it was “precipitous” of me “to go public with an unproven theory regarding video fakery…even if I HAD undoubted proof that the plane videos were faked, I would keep such information to myself…I hope you will reconsider the whole ‘no planes’ hypothesis in this light.” Reconsider? Based on what? The four cleanest ‘crash’ sites in aviation history? Dewdney is some scholar. Now here is my question: if no planers hold the 9/11 movement up to ridicule, why haven’t the corporate media ever brought the issue up again? It has been more than five years since I appeared on Fox and responded to questions about the plane issue. The media certainly support the official conspiracy theory (even Dewdney buys this), so why not hold 9/11 critics up to public ridicule by trotting out no planers more often? Not ever again since I appeared? What the bleep? I’m not just tooting my own horn but the obvious answer is that my appearance on Fox did not go all that well. Citing inconvenient facts takes the wind out of the psyop’s sails and gets people to thinking for themselves and researching on the internet. Got to avoid that. Mr. Reynolds, I just found your site and congratulate you on your comprehensive analysis of the no plane evidence. I’m sure that more and more people are coming around to see the obvious. Heh. Here’s something of an irony. If the gorevnment were anywhere near as evil as the CTers posit, the head CTers would have firsthand knowledge of just how overbroad an FBI evidence search can be, and would therefore understand that only a tiny portion of any videos siezed would turn out to be relevant.Even more irony – If the gorevnment was half as bad and as crass as the CTS claimed we wouldn’t be hearing from the CTs at all. The gorevnment would have hunted them all down and silenced them long ago. According to the CTs the gorevnment has killed thousands already in order to pursue their greedy agenda, so what does a few more basement dwellers matter? Their parents probably wouldn’t even know they were missing until they saw the precipitous drop in the monthly broadband bill and noticed there weren’t any more crushed cans of Mt. Dew and empty bags of Doritos laying around. I applaud Mr. Reynolds for his appearance on Fox News back in 2006. Reviewing the media clips from 9/11 and conducting a frame-by-frame analysis of the video imagery are required to observe and accept the subtle truth. The scenario is actually quite simple: if you want to run a scam where your goal is to blow up the WTC, then you DO NOT need planes. Think of it as a Hollywood magic show. The magician uses “slight of hand” to distract his audience while performing his trick. Hijacked commercial planes crashing into the towers were simply a distraction from the obvious pre-planned destruction of the towers. If you were in charge of a false flag operation, which would you choose: 1. get 19 Arabs to skyjack airplanes, slash the pilots’ throats with boxcutters, takeover the plane in mid-flight, redirect the flight path into the towers AND hope that everything goes according to plan. OR 2. take control of the media airwaves, and use video fakery to fake just ONE airplane hitting the south tower. The pysop began with “breaking news” stories of a supposed plane crashing into the north tower. The masses were then preconditioned to believe the “hijack theory.” Then the masses were hypnotized by the video imagery of the “plane” crashing at the south tower. Once the video imagery was seared into the subconscious mind, it was easy to fool the masses by SIMPLY CLAIMING that other planes had crashed. They could have told us about five other fake plane crashes, it didn’t matter. Despite how obvious it is to deduce that no planes crashed at the Pentagon and Shanksville, some “truthers” to this day still insist that planes hit the towers (i.e. AE911 truth, Loose Change crew, Alex Jones, etc). Even if they agree that no pilot could perform such a feat, they turn to the “remote control” theory, whereby they insist that commercial planes did exist, but were taken over by some type of override system. Sorry, you can’t have “half a scam”. Either they used FOUR commercial planes, or they used NONE. Therefore, given the obvious pre-planned destruction of the entire WTC site, and the incontestable fact of media involvement, the only logical conclusion is there were NO COMMERCIAL PLANES that crashed ANYWHERE on 9/11, only video fakery to fool the masses into believing in planes. and how come there was no 757 wreckage at the penta-con? When conceivable rseoan would the govt. have for not releasing video at the Pentagon? Well, one was released, but no one liked that one. Ironically released thanks to the FOIA request made by a right wing group. Truthers seem to spend more time on message boards and blogs then actually seeking out evidence.The rseoan they didn’t release it earlier was because it was evidence in a trial.Now, with regards to other footage, which footage are we talking about here? The security camera from the gas station? If the government does have the right to release it (do they? ), why don’t you fill out a FOIA form and request it?What other video exists? I’m just curious about what other video exists that isn’t along the lines of the earlier one released. As in, is not only a couple of frames per whatever, but is continuous. Where did the rubble go? Really? The so called rubble covered Lower Manhattan… Piled about 70 feet high covering about a 10 square acre area at the center. Have you ever been to WTC? To Lower Manhattan? Heck anywhere near Manhattan?? Realize that this professor is calling every single one of the family member including the ones they lost, *liars*, complicit with the media in your fantasy conspiracy crap, because they IN FACT spoke to them while they were frightened beyond what your brain seems capable of comprehending, stuck in those planes… helpless. The fact that no planes were involved in the 9/11 attacks must be catching on. It was necessary to reinforce the plane story by fabricating the discovery of landing gear of the alleged planes at ground zero. NYC is such a wilderness that it took nearly 12 years to find it. The fact that there were no planes involved, implicates the news media, top leaders in the federal government and the current and former mayors of New York. lear says it was a hologram that was shown on tv and as well as to the eye witnesses who observed what they saw. as far as any planes. yet don dahler caling into diane sawyer that morning says he was a few blocks away when he heard a loud sound that he describes as a missile. there was obviously no large jumbo jets but the first tower looks like some type of missile hit it. I don’t find the logic compelling behind OBF’s plea to discard all photographic or film evidence just because some is obviously tainted. I’d bring in Ockham’s Razor here, and say that Acebaker’s minimalist trickery is enough. The heavy-lifting can be done conventionally by MSM getting the orthodox version drummed in the public’s mind. Regarding the seismic data, how reliable is this? I mean, I find the NASA thermal hot-spot imagery rather too supportive of the intense heat hypothesis, especially as the authorities were pushing that angle from the get-go? And as far as dubious agencies go, NASA would have to be high up. Raul, to clarify, I have not suggested that the “all photographic or film evidence ” be “discard”ed. I _have_ suggested, as a matter of procedure, that when a witness [i.e the media] has subsequently been found to have provided false evidence, that all photographic or film evidence that had previously been assumed to be authentic up until the time of that discovery, [ and upon which “scientific” conclusions had been based ], should now be re-reviewed, but with a higher standard of proof from the reviewer – that is , instead of the reviewer going for a normal, neutral, scientific, unbiased mindset for re-viewing evidence, that all of the previously assumed to be genuine footage/stills, should, upon re-review, be pre-assumed to be possibly [but not conclusively!] fake unless it can be proven, “beyond a reasonable doubt”, that that re-reviewed footage is in fact genuine. If the re-reviewed evidence is found to be suspect under those new review parameters, _then_ it must be discarded as fake. P.S as an extremely good example of none – “plane into/through buildings like a hot knife through butter” media fakery, the Youtube video currently at the top of Mr Reynold’s home page [ named:” 9/11-NBC- Best of the Detailed WTC North…” is a classic example. If you know what to look for IT IS NOT EVEN NECESSARY TO PLAY THAT VIDEO! Just back off a little and look at the “big picture”, which is nothing more than an easy-to -do , simple layering composite, where the foreground buildings [which , incidentally, are not even true to life representations of the actual buildings!] , have been crudely layered directly over another [independently composed] moving image of a ghostly white building in mid-destruct. [First post, top of page 2 by Simon Shack]. … BG, I am not sure why you are so excited by this douecmntary, the entire premise of it is that 19 Arabs carried out the attacks. It even features the families of the victiims who were on the other side of the phone calls. They didn’t seem to think they were fake. The movie doesn’t even hint at a government conspiracy. James, It’s not a matter of me being excited by this douecmntary.My praise is a matter of what I consider to be “fair play” and intellectual honesty.You and Pat have shown what I considerable an admirable tolerance for various viewpoints in the way you have handled comments here as well as other issues.The fact that you allowed me to post about “9/11 Eyewitness” showed good faith.I don’t believe the path to truth about 9/11, on this blog and other “free speech” platforms, requires anything else.Lately, from my perspective, you have fallen into posting mocking or ad hominem attacks as posts. Perhaps that is what your audience appreciates.In any case, I’ll continue to praise any posts you make which steer clear of defamation disguised as argumentation. “False In One , False in All”? With all due respect Mr Reynolds, I find it very interesting [worrisome?] at this late stage, that in light of the obvious falsity of all of the “plane into building” videos, that you [and others who share your point of view] , are seemingly unwilling to apply what is, sooner or later, really no more than a “standard operating procedure” assumption for any/all legal proceedings that attempt to find truth [and that is quite possibly standard for scientific investigations as well- if not, it should be]. That is, the assumption of “False In One , False in All”. In other words, once the falsity of all of those “plane into building” videos has been definitively established [ as it indeed has] , then examination of _all_ other video ” evidence”, including the lightening fast collapses of WTC 1, 2, and 7 etc. should automatically start with the assumption of “False In One , False in All” firmly in place at all times, _before_ any detailed analysis/scrutiny is actually undertaken [surely?]. I humbly submit that starting from the assumption that the building collapse videos depict actual real world/real time events, after it has indeed become obvious that all of the “plane into building” videos are fakes, is procedurally incorrect from both a legal [and presumably] a scientific standpoint. I am fully confidant that you and your followers would find that, if you start all of your detailed analysis’ of the collapse sequence videos over, with the pre-assumption that the collapse videos are false until proven otherwise,[ “beyond a reasonable doubt”], that close analysis of all of the collapse sequences themselves with that assumption already in place [ possibly after a short course in what to look for regarding vide fakery] , will show them all to be just as fake as all of those magic “plane into building” videos. Regardless of you and your followers present conclusions about those collapses, I still would submit that is not good scientific or legal practice/procedure to automatically assume the truth of all of the collapse sequence footage, in light of the fact that the blatant falsity of other video footage broadcast by the exact same quasi -governmental media organizations, on the very same day, has already been firmly established, way “beyond a reasonable doubt”. With all due respect Mr. onebornfree, it is virtually impossible to figure out what your overall point is but I can respond to pieces of it. Since when have I assumed “false in one, false in all”? You show me the evidence to support your accusation. You cite no quotations or statements I have ever made. Because A has been established as false does not imply B is false. That is obvious. You speak of collapses? What collapse? The twin towers were largely turned to fine dust during destruction, leaving negligible seismic signatures and the bathtub intact, thereby keeping out the Hudson river. Most of the material rolled up and out rather than crashing down. What evidence do you have that a specific “collapse sequence footage” is false? I’d be happy to look at your case but without specifics and evidence to support your garbled statement, it is a nullity. Mr. onebornfree, upon re-reading your comment, still trying to understand it, I think the key phrase in your missive is, “automatically assume the truth.” An honest empirical investigator like me does not automatically assume the truth, I try to discover it. Even if I have a maintained hypothesis or suspicion at the outset, honesty, effort and intelligence in the pursuit of evidence will change my original notion if warranted by evidence. If the truth is “automatically assumed” by person A, why would A even bother with an empirical examination/investigation of evidence? That’s Joe Blow American, believing government officials and lamestream media don’t lie to him, fake stuff or murder its own subjects. Oh no, none of the above because A “knows the truth” by assumption: government is good. And don’t bother Joe B. America with the evidence. The plains Indians assumed “ghosthood” and the white man’s bullets no longer could kill them. Pray hard enough and the Supernatural One grants your wishes. The illusions live on. And I smell a troll on the premises. OBF: Very true. However, if evidence “B” was provided by the exact same organization[s] that has already provided false “evidence” “A”, then surely that is reasonable grounds to undertake a more fastidious re-examination of all other important network video evidence previously assumed trustworthy [i.e. B] and then used to draw purportedly important scientific conclusions from, but this time around with a newly raised level of skepticism [“burden of proof”] that now automatically assumes “false in one false in all” until definitively proved otherwise ? Shouldn’t our “alarm bells” be going off regarding all of “evidence” B, in the light of what we already know about [false] “evidence” A? OBF: Agreed, that is what the TV video collapse sequences [or whatever you want to call them- semantics has no interest for me] appear to show. However that does not prove that the aired”collapse sequence” videos themselves are not fake, just like all of the “plane into building” videos. I humbly suggest that after the discovery of fake video footage of crucial events of 9/11 delivered by our ” trusted media”, that it is preferable to err on the side of extreme caution regarding any collective, assumed authenticity of any/all other network footage, and that the burden of proof has now dramatically shifted [or should have 🙂 ], with regard to all other 9/11 network video evidence provided by our “trusted media”, and that all of those network-aired “collapse sequences” [or whatever you wish to call them], should automatically be assumed to be “questionable”, at the very least, until closely re-reviewed and decisively demonstrated as being authentic. OBF: By the same token, what evidence do you have that any “collapse sequence footage” is real? . At this point in time I can see no reasonable grounds for us to assume that any of it is genuine :- ) . In light of the other obviously faked video evidence crucial to upholding the official story, why would you [or anyone else who believes the “plane into building” videos are all fakes], continue to automatically assume that some/all of the rest of the imagery broadcast that day [and actively used by the government to make its case], is real? In light of that already discovered fake footage that you are already aware of, shouldn’t you naturally be just a little bit skeptical about the authenticity of any/all of that previously assumed to be genuine, tower collapse sequence footage ? Further more, why, from the outset of their investigations, have trained scientists such as J. Wood and S. Jones automatically assumed that the broadcast WTC 1 &2 collapse footage they have all analyzed so exhaustively and based their conclusions on, is real ? Surely this is not methodologically correct, scientifically speaking ? [ask J. Fetzer? ]. What proof do they have that any of those sequences are real ? In terms of looking for obvious signs of video fakery, would they even know what to look for? Did they perform detailed examinations to try to determine the authenticity [or not] of any of the video sequences they have spent so much time drawing their famous, controversial, “irrefutable ” “scientific conclusions” from, _before_ they commenced with their analysis and before they drew any of their conclusions ? If so I have not come across it [possibly I missed it ?] Regards, onebornfree. This is quickly turning into a waste of my time, but one more attempt. We stipulate that because A (airplane videos) is fake, it does not imply B (collapse sequence video) is fake. But you offer no evidence whatever for your skepticism (or whatever we call it) about the authenticity of what you erroneously call “collapse footage.” You never come out and say, “All collapse footage (B) is fakery.” You’re a slippery one. You apparently just want to raise doubts and accuse the rest of us of being naive and unscientific about such videos. In any event, you offer no reason to believe your proposition except the fact that the airplane videos were faked. That’s a non-sequitur, we already disposed of that contention. You offer no direct evidence for manipulation or fakery. If you’ve got some evidence, I’d be delighted to look at it. Further, the “dustification” videos we have all seen are consistent with each other (“internal consistency”) and more importantly all the other evidence (“external consistency”) from the WTC: punk seismic impact, intact bathtub, eyewitness testimony about choking on dust so thick it blocked out the sun, a one-inch-plus layer of dust throughout lower Manhattan, dust reaching into the upper atmosphere for days instead of settling out within 15-20 minutes, the paucity of steel, absence of stacks of floors, not a single surviving computer, toilet, etc., etc. 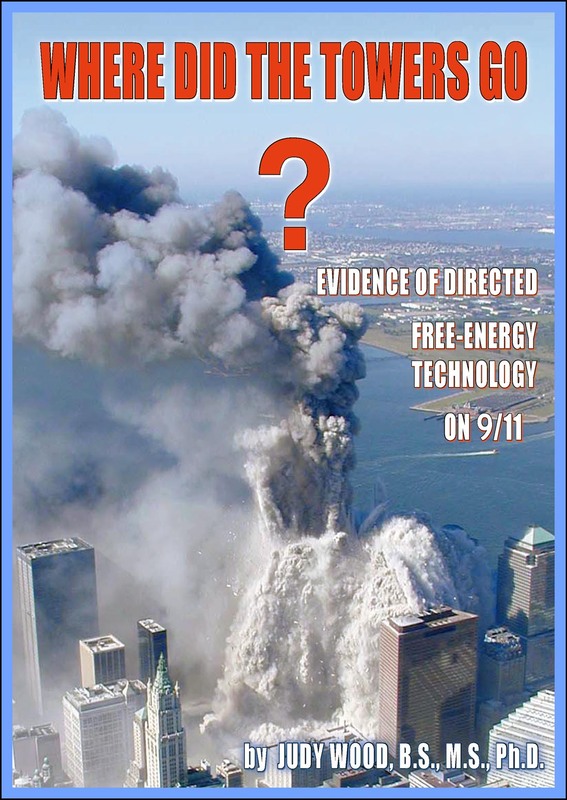 We know the twin towers and their contents were largely converted to fine dust from every piece of evidence, not just videos, that’s why Dr. Wood titled her book, Where Did the Towers Go? Read it. Maybe you’ll get hooked on bringing evidence to the party instead of unsupported conjectures. That is not true, Mr Reynolds. In my previous post I gave you a link to a 14 page forum thread that is dedicated to exactly that: a detailed analysis of all of the post-plane-impact imagery broadcast that day by the media, and also of the various famous and not so famous still shots purportedly taken by photographers that day and in the days following. OK, you’re right, I overlooked the link and will study that evidence, chew it over and comment later. Thanks. I’ll be interested to know your eventual thoughts/reactions. You can contact me at onebornfree at yahoodotcom if you have any questions about the site and its materials [ I am _not_ a contributing member there, by the way]. Regards onebornfree. A long shot, I know, Mr Reynolds, but I would humbly suggest that one day you consider the idea that the Youtube video that you have posted at the top of your front page as of Jan. 20th. 2012, titled “9/11- NBC- Best of the Best detailed WTC North Tower collapse (3 diff. view points). “, is a fraud from start to finish. That is, that each of the supposed 3 “different” perspectives shown are nothing more than 3 different yet synchronized, computer simulations/animations [easy to do when you know how and have the correct software], none of which have anything to do with the reality of that days events [ including their original “live” audio]. I was working about 25 feet from the northern windows on the 27th floor of WTC-1 with two other people on 9/11. We were quietly working at our computers with no one else within 20 feet of us. At 8:45 only about a third of the staff were in. Granted the windows didn’t open and we seldom heard outside noises, but if a plane was about to hit 500 feet above us with its engines roaring, I’m sure we would have heard something before the big boom. Silence from a kamikaze 767 airliner, screaming along at 442 mph at 1,000′ altitude? Weird. Thanks Robert. Time to plug my analysis of ear- and eyewitness testimony at the WTC. The flack is always heaviest over the target–you and Dr. Judy Wood on right over that target. Members of the official 911 cover-up and the alternative 911 cover-up (911 Truth: plane huggers/thermite lovers) are putting their hands over their ears–they don’t want to hear it. Thanks. Yes, flack is heaviest nearest to the truth. Example: I know my article hypothesizing a fly-by over Manhattan was wrong because it was not attacked!